On our last night in Dresden, Dan and I set out across the Bridge from the Old Town and headed over to spend the evening in the Neue town. Across the Augustus Bridge from the Palace Square, we find the giant statue of Augustus the Strong made all in GOLD, atop a giant black, marble pedestal. Since Augustus, the Strong was such an influential figure in Dresden when he died in 1733 his son Augustus III had this statue created to mark the illustrious career of his father. Augustus was truly a revolutionary man in the building of Dresden as a world-class city, so it is very fitting that this is the statue that greets you as you enter the New part of the city. As soon as we crossed the bridge, as we were looking up at this figure, it began to POUR rain! 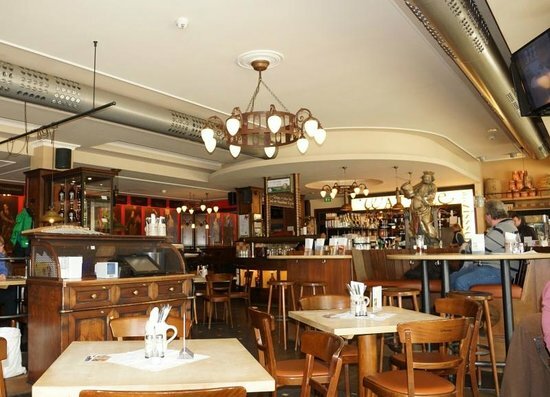 We immediately ran as fast as we could down the street to the Watzke Brewhouse where we thought we could find a lovely, traditional German dinner. Watzke Brewery is a local owner brewery with three different restaurants around Dresden serving up fantastic food and their fresh, seasonal beer. It was so cold and having got a little it wet in the rain on the way in, a warm bowl of soup and a fresh pint of beer sound like just the thing to warm our bodies and souls. For dinner, I opted for the traditional pork knuckle. I had wanted to try this dish all the time we were in Dresden but never found the right moment when I was hungry enough o give it a go. But this was finally that moment, and I savored every little bit of it. It was both crispy and tender. The bed of sour kraut and gravy it was served atop was phenomenal, so fresh and zingy. The little dumpling was the ideal final touch to this bowl of German perfection! After dinner, we were entirely too full. Seeing as we still had a fair bit of the night left, we thought to work off the dinner we just had, we would spend the rest pf the night exploring the rest of the Neue Town. After our night tour, there were a few places we wanted to return and see as well as explore other little areas of town we didn't get to see the first time. We walked along the Hauptstrasse, a prominent shopping street that was right outside the restaurant. We were looking to pick up a few things at the pharmacy before heading out of town, so we strolled down the street hoping to run into one. We poked our head inside a few different shops along the way, seeing what the everyday Dresden resident would see on their shopping day out. 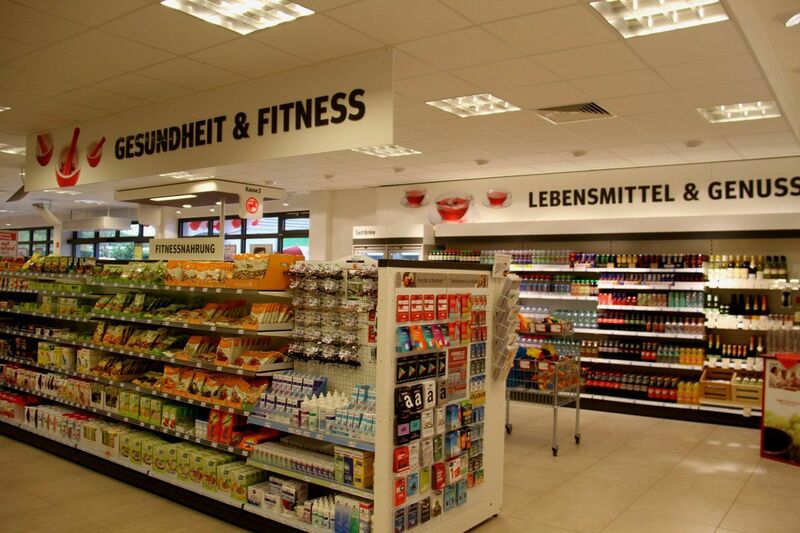 We stopped inside Rossmann Drogeriemarkt, which might sound boring but I enjoy browsing through foreign grocery stores or just local pharmacies. I like studying the little difference, the similarity, the different products they have and even just the branding of everything in the store. We walked all the way down the Hauptstrasse, crossed Albert Platz and headed onto a street called Rudolf-Leonhard-Straße. This long laneway was full of trendy restaurants and trendy cafes. We stopped off at this adorable little Tiki Bar towards the end of the night for a night cap, and a bowl of tasty ice cream we had heard was something we simply had to try. I got a mojito and Dan bought himself a white Russian. Unfortunately, they didn't know how to make a white Russian and creamy ice cream on top of dairy-filled alcoholic beverages was not the best combo...hahaha. 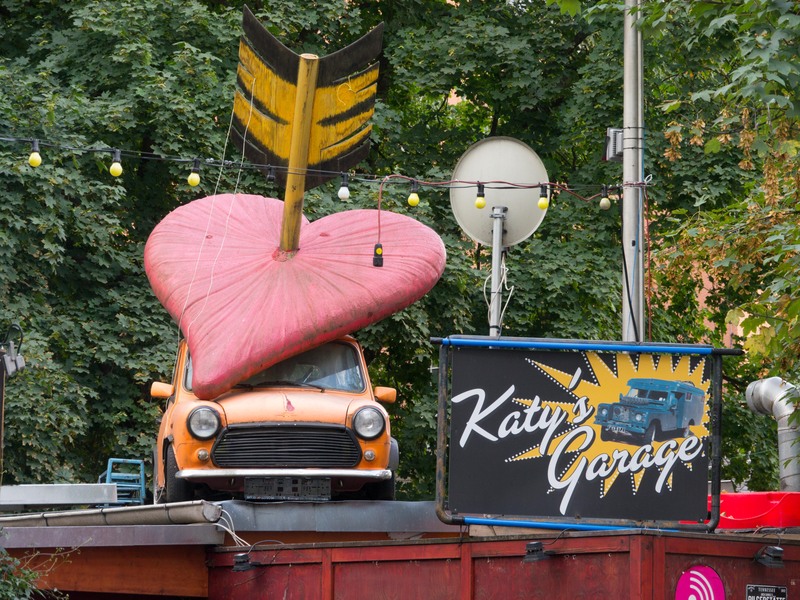 On the way home we passed by the Dresden favourite, Katy's Garage. They were having an open mic slam poetry night, and the whole place was full, despite the weather outside being rather on the chillier side. This place is a very iconic symbol of the New Town, covered in IN Mickey Mouse flags and decorated with old mini coopers scattered around the bier garden. Old bikes hang off the walls and around the fence, and a few sun chairs and umbrellas are set up outside for a makeshift beer garden when the weather permits. We were exhausted and didn't think we could handle another drink, but it was nonetheless pretty neat to check it out, even just by peeking in the door, and people watching the guests walk in and out of the club. On our way back to the hotel, we walked by a grocery store open late and thought we would stop inside. We needed to pick up a few treats for out train ride the next morning and I couldn't wait to check out what German snacks we could get out hands on. We grabbed some grainy mustard to take home as well as some cheese and jam for the train to Prague tomorrow. We must have spent an hour exploring the store and admiring all the different things on offer. The strangest things we found was the large section of Marzipan. There was the regular piece of marzipan shaped like fruits and flowers, but then there were also lots of marzipans shaped like traditional German food.It looked realistic but was hilarious at the same time. Dan's favourite section of the store was the pretzel freezer. And the entire part of the store dedicated to our favorite treat. When we finally got home, we were happy to see that our luggage had FINALLY arrived. After three days of being separated from fresh clothes, new socks, my toothbrush and more, it was a sweet reunion. Tonight would be our last night in this gorgeous hotel, so we spent the rest of the evening simply lying around, drinking a few beers we picked up on the way home and chatting out all the exciting things we had seen and done while in Dresden! Hi, I'm Laura! I love to travel but more than that, I love to learn. Education and exploration together are two of my life's greatest pleasures. Never stop learning, never stop journeying. Creative Adventurer is a travel blog with guides to help you get the most meaningful and unique experiences out of your wanderings. Learn more about me here!